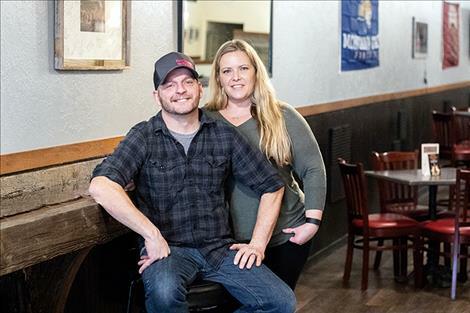 Dusty and Mandy Kisler own Perfect Shot Tavern in downtown Polson. Perfect Shot Tavern is now open in the former Vine and Tap location. 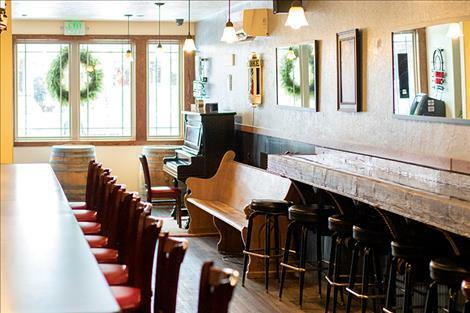 POLSON – The bar at 18 Main Street in downtown Polson, which for several decades was known as the Wolf Den and more recently was the Vine and Tap, now has a new name and owners. Dusty and Mandy Kisler purchased the bar in August, and named it Perfect Shot Tavern. The couple’s goal is to provide a comfortable place for the community to gather and enjoy a few drinks with some entertainment. “Mandy is the owner, and I just work for her,” Dusty said with a smile. Over the last few months, the Kislers have upgraded the interior walls of the tavern with rustic barnwood, moved some furniture around, added more seating, softened the lighting and installed four large-screen TVs. The Kislers are not finished with the upgrades and have many other changes in the planning stages. On Tuesday, Jan. 1, a banner was placed above the door to announce the new name. A permanent sign is soon to follow. Dusty has owned three businesses over the years. This is his first venture as a tavern owner, but it isn’t his first time working behind the bar. He has been tending bar as a hobby for more than 16 years. “I just always loved the mixology and the people aspect of it,” he said. In an effort to move away from the public perception of “I thought this was just a wine bar,” the folks at Perfect Shot Tavern want people to know that they have a variety of mixed drinks and more than seven craft beers on tap along with a selection of both domestic and craft beers available in bottles. The tavern has an appetizer menu with full breakfast, lunch and dinner options available from Pop’s Grille 214, which is located next door. Perfect Shot Tavern is open Monday through Thursday from 2 p.m. to 10 p.m., Friday from 2 p.m. to midnight and from 10:30 a.m. to midnight on Saturday and Sunday.